Hanson Hills: 1/16/2019 High winds overnight have produced some fallen debris on the Nordic trails. Groomers Tommy G. and Jason are out cleaning and grooming skate lanes this morning. Conditions will be fast today, as we also received some freezing rain. XC Ski Headquarters: We received about a half inch of snow last night. Groomer Mike is snow combing the skating lanes on all trails this morning. Conditions remain in good shape! 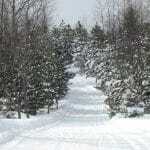 For the best conditions, head to the Rolling Hills, Wild Turkey, Mackinaw Cut, Trapper’s Cabin, and Manitou trails. There are still some oak leaves down, and some of spots under the big trees are becoming hard-packed and getting their share of pine needles, but conditions are still good for classic and very good for skating. Snow Spreading efforts on the Trappers Cabin trail are going well, too! We will have good to great conditions on the majority of the trails for the weekend. *Please note that we will be continuing to spread snow on the Trapper’s Cabin trail today, so watch out for tractors and large chunks of snow! Today: We have touch of snow pushing through from North to South this morning and this will lead to a skiff to maybe an inch of accumulation in areas by daybreak. This could help many roads with a little bit of grip after freezing drizzle has created slick roads. Temperatures are in the mid teens to low 30s but you will see these temperatures fall through the morning and eventually stay steady in the low teens to mid 20s today. Winds are out of the North/Northwest at 10-20mph with gusts around 25mph. Today will start with some early morning light snow but turn partly sunny with isolated lake effect. Areas that could see a little snow will be closer to the Lake Michigan and Lake Superior shorelines. Highs will be in the low teens to mid 20s with winds out of the North/Northwest at 5-15mph. Tonight: Skies will be partly cloudy to mostly clear tonight with isolated flurries in spots to start the night off. Overnight lows will range from 2 below to 11 above with light winds. Thursday: Skies will start off with some sunshine Thursday but clouds will move in for the afternoon and evening with a chance for some light snow in spots. Highs will be in the low 20s to low 30s. Friday & The Weekend: We will again have some isolated lake effect Friday with most areas seeing partly sunny skies. Highs will be in the mid teens to low 30s to end the work week. Saturday is looking cloudy with scattered light snow showers in the Lower Peninsula as a storm system brushes by to our South. Highs will range from 8 to 20 degrees and accumulations as of right now should be minor. Sunday is looking cloudy with lake effect snow. It is going to be very cold with highs ranging from 0 to 15 degrees. Next Week: Monday is looking a bit better with mostly to partly sunny skies. Highs will range from 10 to 18 degrees. Tuesday is looking cloudy with scattered snow showers as another storm will miss Northern Michigan to our South.